Bath have announced the signing of Ireland international lock Ryan Caldwell. Caldwell, 26, has agreed a two-year deal and will move to the Recreation Ground from Ulster this summer. He follows another new second-row addition to the Bath squad, England's Dave Attwood, who has been recruited from Gloucester for next season. 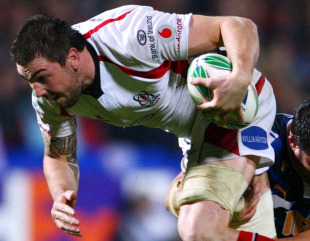 Caldwell has made 79 appearances for Ulster and was capped twice during Ireland's tour to the USA and Canada in 2009. "Ryan will be a very good addition to the club," Bath rugby director Sir Ian McGeechan said. "He has very good skills already, and he will develop these further as he matures. He is a big, powerful young lock, and so will create some real problems for the opposition." Caldwell added: "It has always been a huge ambition of mine to play Premiership rugby, and am very excited by the challenge it presents."